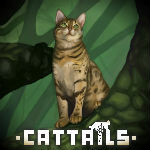 Walking in Place | Cattails: Become a Cat! After a border skirmish between colonies, a few ally cats were standing around. When they started to walk away, I noticed that one kept walking into a bush. After about one in-game hour, they finally went in another direction and walked off of the map. It was a pretty funny experience. I can't wait for beta!